Next week, a new restaurant will fill the space vacated by Gerard Pangaud Bistro, which closed last summer. Chef Martin Lackovic, formerly of Galileo, I Matti and The Caucus Room, plans to open Siroc Restaurant on McPherson Square next Friday, Jan. 16. Lackovic is partnering with brothers Keram and Mehdi Dris, who will work the front of the house. Siroc's seasonal menu will feature cooking inspired by Italy and the Mediterranean with housemade pastas, charcuterie, salads and entrées. The new restaurant, located at 915 15th St. NW, takes its name from a wind that blows from northern Africa to Italy and the Mediterranean. 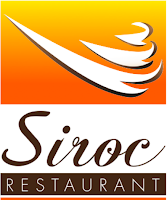 Siroc will be open for dinner Monday through Saturday and lunch Monday through Friday. I can't decide if the logo is wonderfully cheesy in a nostalgic kind of way or just cheesy. This is going to be great -- I can't wait!